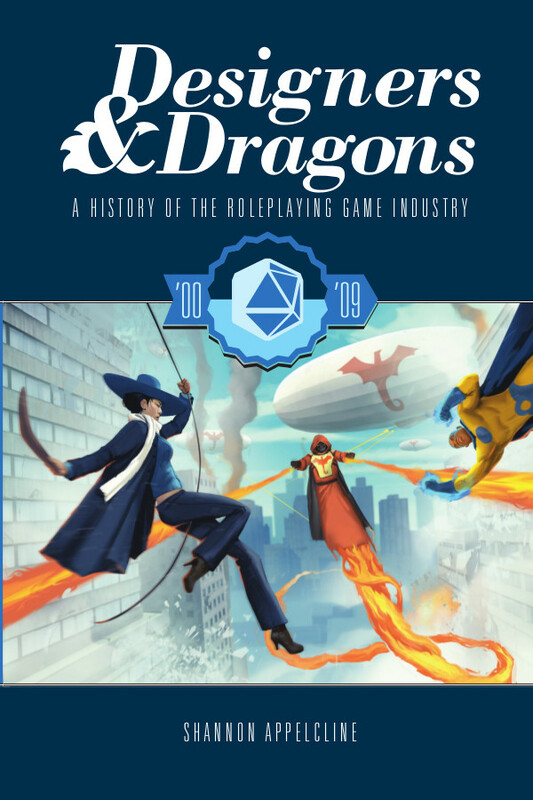 The history of ten years of roleplaying history in one handy volume. 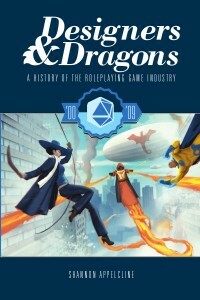 Designers & Dragons is a series of books on the history of roleplaying. Each book focuses on a decade, from the ‘70es to the ‘00s, and takes a look at the trends, companies and designers that were prominent in that time. I took a brief look at the ‘00s one, as that is when I’ve mostly been active, and because I’m most interested in some of the things happening in the Indie scene from the early ‘00s onwards. The book is divided into eight parts, each focusing on a particular trend. A couple focus on D20 games, a couple focus on indie games and a couple focus on other trends in roleplaying. Each part contains chapters dealing with one of the publishing companies prominent within that part of the hobby. For each company, the book gives a chronological overview of what happened to that company. The book goes into a good amount of detail, and also describes the important characteristics and innovations of prominent games in the company’s line. Here and there, the book includes fact boxes, detailing minor developments or tangents to the main topic of that section. For instance, the section on D. Vincent Baker’s Lumpley Games includes an aside about Night Sky Games, which is run by Baker’s wife, Meguey Baker. At the end of each chapter is a box of suggestions on what to read next, divided into related aspects from the same book, related aspects from other books, and related people present in other chapters of this or other books. My impression: I will start off by saying that I did not read through all 458 pages of this book before making this review. I don’t think I ever would, either: there are some sections that just don’t interest me. For instance, I have never had any interest in Pathfinder, and I have no reason to read the section about the development of that brand. On the other hand, the development of the Indie scene is a scattered and confused affair, and I am excited about the prospects of a tome giving a more-or-less coherent overview of that narrative. I am really impressed with the level of detail the author goes into, and I will look forward to when I’m able to spend more time delving into it in a bit further. Having said that, I’m not sure I’m a fan of the “company” approach. Going through each company in turn transforms the history of the hobby into a number of more-or-lesss connected narratives about this or that person doing this or that at a given time. I would have liked a more coherent narrative. I would also have liked a look that focused a bit more on things outside of the publishing world. What about conventions, for instance – how did they change? What about the roleplaying media? Both aspects are mentioned here or there, but a run-through of the environment of the games’ creation could have been useful. All in all, this is monumental work, and a very interesting one – if nothing else, then because it (to my knowledge) is the only work looking at the whole history of roleplaying. It’s for geeks, who have an understanding of the hobby as it is to day, but for those geeks, there is loads of interesting stuff here. How would I use this: This is the kind of book that is interesting as background knowledge, while having almost no impact on the games you actually play. I want to read more, particularly about the development of Indie games, but also the development of GUMSHOE and the White Wolf line of games. Besides, it is fascinating to delve into the genealogy and legacy of many of the games that are at the centre of the hobby today.